During the first week of August Cliff and I celebrate three wedding anniversaries, our son and daughter and their spouses along with our own. Our children are beginners at marriage (sort of), but for us it’s # 47, three years away from golden. Our romance was of the “Some Enchanted Evening” sort, recounted in an earlier blog post which near the end merely hints of conflict to come. In the beginning, there was the clash of cultures: a high-energy, pioneer-type from the Pacific Northwest marries a Mennonite school teacher from southeastern Pennsylvania. As my mother-in-law said on our wedding day, “You two will have a lot of adjustments to make.” I knew that was true in my head but naively imagined of course we will be the exception: Doesn’t love conquer all? In the early days it was all about him. His favorite foods . . . . favorite flavor of ice cream, and whether he liked my hair up or down. I loved to make him laugh, and worked hard not to cry in front of him. I cleaned my house before he came over, always wore mascara, always had champagne in the fridge. [But] we’ve seen each other at our worst, and that’s not an exaggeration. Physically ill, emotionally grief-stunned, job-panicked, or angry enough to throw crockery at the wall . . . . Red-faced, blotchy, hoarse from yelling. Our parents grow old, and ill, or nutty: our children make mistakes that drop us to our knees. Through it all, how on earth can he love me, given what a flawed, messy, moody person I am: The artifice is long gone; he see me. Adam Gopnik adds metaphorical wisdom: Love, like light is a thing that is enacted better than defined: we know it afterward by the traces it leaves on paper. One of the beloved members of our family has gone home to be with the Lord this week. Following the publication of this edition, postings on this blog will be suspended for a time. When the artifice of love is gone, you can genuinely appreciate what love is–and having that love, I hope, will sustain you through your current grief. Happiness and sorrow, both part of life. Wishing you all best, my blogger friend, and I will wait for your return to the blogging world. And you are right. There is bitter and sweet in all of life. Happiness to all concerned as you approach the wedding of your daughter. Savor each moment! Thank you, Marian. I definitely will. Dear Marian, We share the sadness of your loss. Your family is not a “cast of characters” but has become part of our lives as well. Much love and sympathy on your loss; all is a part of life and daylight will follow the night. Mimi, I count you as one of the family too as you identify with my family members and then see echoes of their experiences in your own. I appreciate your condolences. Life, death, and eventual re-birth. Ah, yes, daylight will follow the night, as you remind us. Happy Anniversary. That’s a long time to tolerate each other. HA! Beautiful post. Tolerate, appreciate – tolerate, appreciate. Yes, there are lots of opportunities to practice forbearance in a long marriage. Right now, we celebrate! 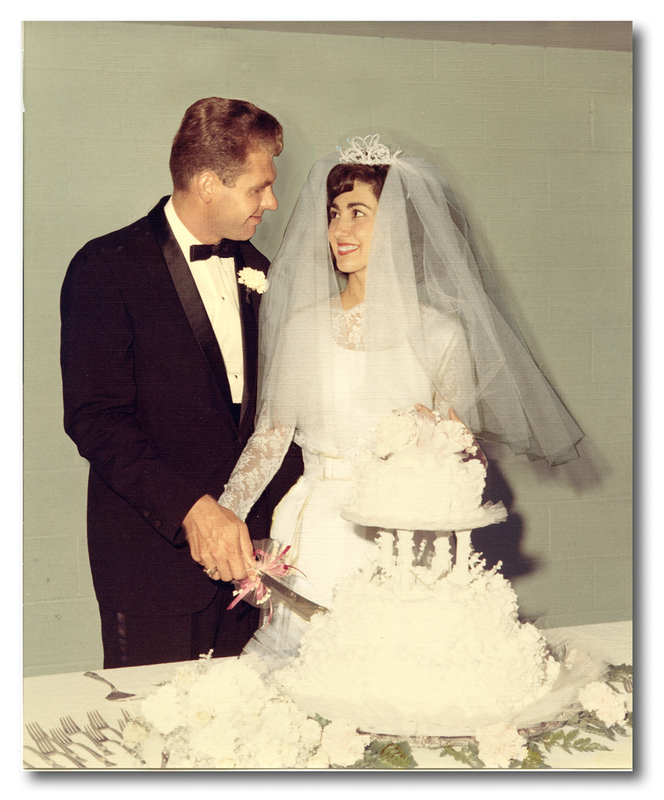 Marian — Congratulations on 47 years of marriage! After 34 years of marriage to Len, “the artifice is gone,” the chaff has been carried away by the wind, and we’re down to the real deal. Far better than anything we could have imagined when “the scales” were still on our eyes. You and I both know that death is not the end, merely a continuation. Yet harder than hard for those of us left behind. I look forward to your return. Thank you for both your congratulations and your condolences. Both are part of life. Putting my mother to rest is beyond hard, but there is the hope of resurrection and life eternal. You have no idea how much I appreciate your support (and that of all my readers) during this time of loss. Wonderful post, Marian, and happy anniversary! I will continue to uplift you in my prayers: rest in Him and heal. I will take your advice – right now in small bits. Thank you for your uplifting words. I really appreciate al of it, Traci. Thank you! Happy 47th Anniversary to you and your hubby. 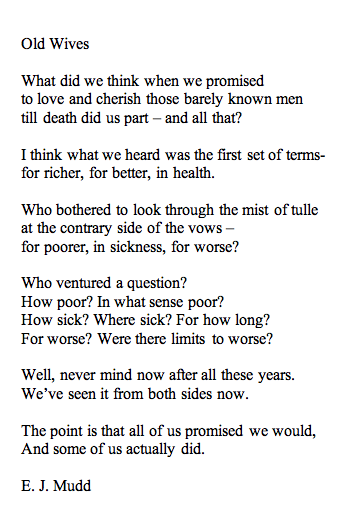 In sickness and in sorrow… It is good to know you are there for each other at this time. Your phrase “in sickness and in sorrow” means a lot to us right now. Thank you for the remembrance, Darlene. Marian and Cliff … Happy 47th Anniversary. We also will be celebrating our anniversary this month. But we’re pikers compared to you two – just 30 years. Thru the good times and the times that test us … may you overcome those challenges and come out stronger. Our condolences on the loss of your mother. Thank you, Judy, and congratulations to you and your hubby on your thirtieth! Nice to see you again on “plainandfancy,” Melodie! Many congratulations Marian! They say that the first 47 years are the hardest! But how wonderful to have shared your lives with each other. You are so witty, Susan. Thanks for the congratulations and also for your expressions of sympathy during this time of our mother’s home-going. This time is bittersweet: wonderful memories mingled with missing her terribly. Debby, this post was written weeks ago and because it was relevant during the first week of August, I decided to schedule it in spite of the sad intervening event. Thank you for appearing here with a comforting comment. Wishing you many more happy years! Marian, your mother has become part of the whole family you have created around you and now lives in your life as well as ours and as well as her own in some glorious transformation. Blessings to you and your family as you continue to grieve and celebrate. Loved the anniversary thoughts also. We share a birthday month and an anniversary week. So I identify even more than usual as Stuart and I passed the 45-year-mark last Saturday. I read your post from 2009 with great interest. You and Stuart are such a team that I suspect your tips were a collaborative effort. RIght? A happy marriage is such a treasure, and you reflect that in both your tone and the content. Yes, you are right – our family is grieving and celebrating, a mingling of disparate yet complementary emotions. Thank you for the noting our parallel milestones. It never ceases to amaze me. So grateful for our friendship, Shirley. Marian, my heart goes out to you as you grieve and at the same time celebrate your mother’s life. She has been a central part of your existence and so much history came from her memories. Thinking of you as you adjust to a new normal. And a happy anniversary to you and Cliff! August is a good month for marrying. Our anniversary is on the 15th and we’ll be celebrating 32. Thank you for sharing so many of your family stories and memories here. They always lighten my load a bit. There’s such charm, love and warmth to them. I love seeing your smile on this post. Yes, we are moving into a new normal with many friends and lingering memories to support us in our adjustment. Congratulations too to you and Bob on your 32nd. Your challenges earlier this year have no doubt drawn you closer together in love. Thank you for always cheering me with encouraging comments. I’m glad my posts lighten the load, one of my purposes in writing memories and more. Thank you, Sherrey. I love this, Marian. Your story and the quote by Larkin Warren resonate. “He sees me.” For me, that’s the crux of a strong marriage. He/she sees me at my worst, and they’re still here. Thinking of you and your loss. Somehow I imagine your family pulling together to hold this with strength and love. Yes, we are, Elaine. It seems like a month, not a week has gone by since our Mother’s home-going. My sisters and brother have traipsed all over the county to appointments, including fun things among the rather strange activities we are doing as we walk down the path of grief, with which you are very familiar. Thank you, Anita. Unfortunately, my next post is less up-beat. My Mother died since this post was written, so Friday’s post is a tribute to her life. Glad you are following my writings as I do yours. I lived in Landisville for three years. Every Tuesday I went to Root’s. Every Friday I went to market in Lancaster. I grew herbs and a neighbor had a prolific garden. I ate nothing from a box..nothing prepared. My neighbor even made bread and pasta. Best three years of my life. I want to go to Root’s so badly I’d even put up with the Tuesday before Easter!!!! Also my cousin, Dorie Heisey married Harry Longenecker and they live in Rheems. Relation? I am now in Winter Springs Fl. Welcome to my blog, Barbara. I wonder whether you were prompted to visit my blog by another reader, J. Philip Aungst, who commented just yesterday on the blog post “Anna Mae and Hiram: A Mennonite Wedding.” https://plainandfancygirl.com/2014/06/21/anna-mae-and-hiram-a-mennonite-wedding/ The movie clip in this post was filmed by my Aunt Ruth Longenecker, Principal of Rheems Elementary School. Whatever your reason for commenting, I hope you’ll visit again. As you can see, I write of my Mennonite past in Lancaster County with strong ties to Bossler’s Church and the many families that used to attend: Longeneckers, Garbers, Rutts, and of course Aungsts! My great grandfather, Simon Bossler Landis, taught Rheems school circa 1920. My grandmother, Mary Espenshade, had my mother with John Landis (son of Simon) in 1922. Yes to your question about my brother Phil, and the sale at Root’s. I am certain my Aunt Ruthie Longenecker would know your grandparents. I have heard her talk of Mary Espenshade. We certainly share a similar childhood. Thanks for visiting, Barbara. Come again soon!